Lets take a road trip to experience India’s longest highway tunnel, Chenani-Nashri tunnel on the Jammu-Srinagar National Highway. 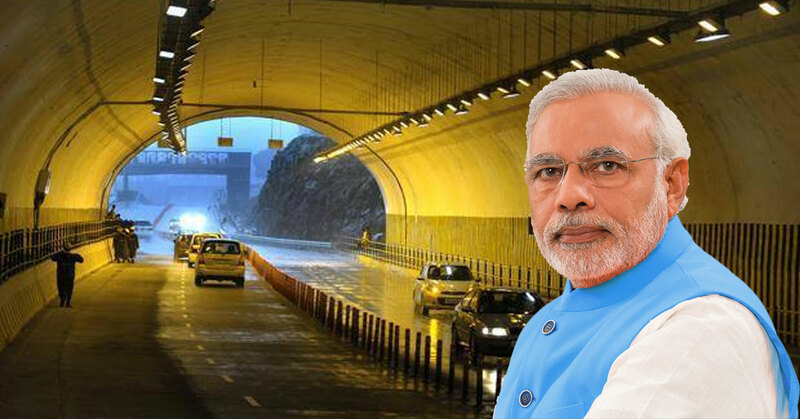 India’s longest highway tunnel will be inaugurated by Prime Minister Narendra Modi on April 2. The Tunnel Built on the lower Himalayan range at a height of 1,200 metres. Tunnel's work started on May 23, 2011. The total project cost is Rs 3,720 crore for buliding this tunnel. The length of the tunnel is 9.28 km. The main tunnel is 13 metre in diametre and the parallel escape tunnel is 6 metre diametre. The Tunnel is connected by 29 cross passages at 300-metre gap. The travel distance between Jammu and Srinagar will be reduce by 30.11 km. and the travel time will be reduce by at least two hours between these two cities. Worth Rs 27 lakh, Fuel can be save daily by using this tunnel. This tunnel is the part of the Jammu-Srinagar highway which is a 286-km-long four-lane project. Speed Limit will be 50km/hour with the low beam headlights in the Tunnel. The tunnel has an integrated system to control power supply, video surveillance, ventilation, communication, SOS call box, FM signal repeater and fire fighting and incident detection. This tunnel is meant to avoid stretches of National Highway 44 prone to avalanches and landslides. Note: The world’s longest highway tunnel is in Norway which is 24.51 km long.